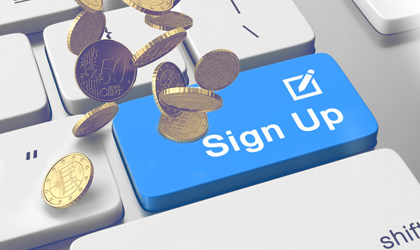 Signup bonuses, also termed first deposit offers, new player bonuses, and many other names, are the bonuses that you will run into when creating an account. This is actually a succession of bonuses and not a single offer. This distinction is important to remember, as sometimes the offers play with big numbers to give the wrong impression. For most players, it is important to know that you can easily get your money's worth by simply depositing ten or twenty bucks. The most usual signup offer, one you get right away as you sign up, are free spins. These are generally not worth much, which is why they tend to come for free. They are enough to try the site before you decide whether or not you want to take advantage of the real offer to claim the big benefits. What do you get and with what? The casinos might offer you just about anything as a signup bonus. Free slot spins, cashback, no deposit offers, bonus money, raffle tickets, special games, even free stuff like Amazon gift cards. At this point, they also tend to demand a deposit. Signup bonuses, besides a handful of free spins, tend to always demand a deposit. When deciding what kind of a deposit you are going to make it is important to really understand the numbers. When talking about bonus money it is important to understand percentages. A casino that advertises a first deposit bonus of thousands might also require a deposit of thousands. Far better to instead look at how much bonus money you are going to receive in relation to the amount you deposit. These days a good bonus is between 150% and 300%, depending a lot on the other factors such as wagering. Remember to also check the minimum deposit. It is usually enough to give you a nice match for the bonus money, plus all the other add-ons such as free spins in their hundreds. Many times the signup bonuses come in three or more parts. This means that you don’t always have to make the most of them: simply use a deposit sum that you feel comfortable with, and claim your bonuses with that. Bonus money and free spins almost always come with wagering requirements. This means that any money won with either of these needs to be played through a set number of times. Wagering requirement might go as high as 50 or 60 times the original sum, though in such cases it is better to look out for other casinos. A normal wagering is about 30 - 45 times the bonus sum. Quite a lot of casinos have done away with wagering altogether, though in these cases some have decided to implement a limit on how much money you can win with bonuses. In these cases it is always better to go with higher wagering requirements, as winning a jackpot and only being able to claim a hundred euros is nothing short of frustrating. Choose carefully and make your money count! And remember, if you already have an account at the casino you are not allowed to create another one! Better to simply choose another casino!